The ESTJ personality type is nicknamed the "Overseer" and belongs to the SJ Protector temperament. ESTJs are responsible and hardworking. Tradition and loyalty are deeply valued by them. As quintessential leaders, ESTJs provide structure and high standards to followers. When making decisions, they rely on logic and facts. Overseers are efficient and thrive on routine and stability. They are committed and predictable people. Directing their energy outwardly, ESTJs are gregarious, talkative and assertive. They like groups and social gatherings and are energized by interaction. Overseers process information through their senses. They are concrete, realistic, practical and factual. As Thinkers, ESTJs are logical and objective. They are firm with people and can be critical. They are frank although not always tactful. Overseers are decisive and organized. Their lives are structured and scheduled. They are quick at tasks and enjoy finishing projects. They seek closure. ESTJs are loyal and committed to family. They appreciate lasting relationships with friends and neighbors. They seek to preserve traditions and create security for their loved ones. ESTJs enjoy the simple pleasures of life and do not like to feel controlled or taken advantage of. ESTJs are concrete learners and often do well in school. Teachers appreciate their dependable and studious nature. ESTJs are able to study hard and excel in a variety of fields. They often choose careers that call upon their leadership abilities. ESTJs can often be described with these words. They commonly posess the following strengths and weaknesses. ESTJs make up about 13% of all 16 personality types. There are more ESTJs than any other personality type. On average, people are more Extraverted, Sensing, Thinking and Judging than the other preferences. 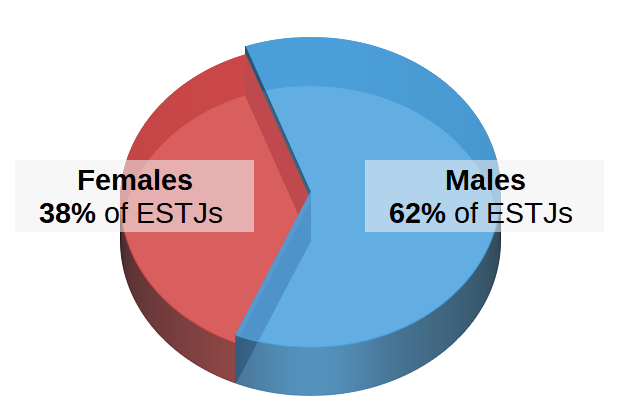 1 in every 6 males is an ESTJ (16% of all males). 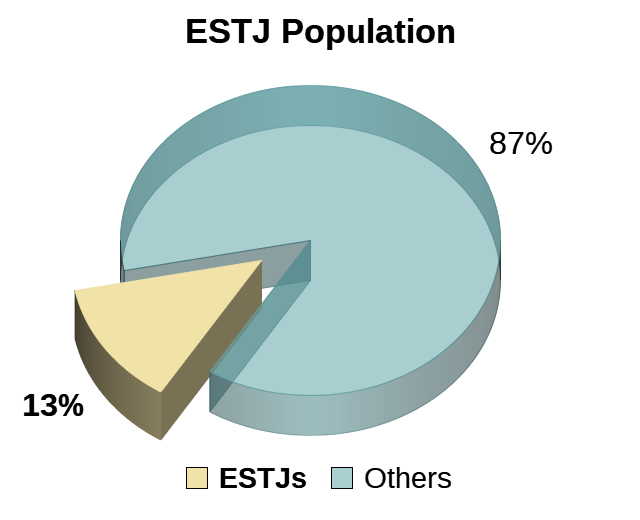 1 in every 10 females is an ESTJ (10% of all females). There are more male ESTJs than any other type-gender combination, with the exception of female ESFJs. There are significantly more male ESTJs than there are female ESTJs. Just over one-third of ESTJs are female. One reason there are more male ESTJs is that males tend to be Thinkers (T) while females are more often Feelers (F). The ESTJ's Preferences are Extraversion, Sensing, Thinking and Judging. These determine the ESTJ's Personality Type. Extraversion is characterized by a preference to focus on the world outside the self. ESTJs are energized by social gatherings, parties and group activities. Extraverts are usually enthusiastic, gregarious and animated. Their communication style is verbal and assertive. As Extraverts, ESTJs often need to talk. They enjoy the limelight. Thinking prioritizes objectivity. As Thinkers, ESTJs make decisions based on facts. They are ruled by their head instead of their heart (but are not without emotion). ESTJs judge situations and others based on logic. They value truth over tact and can easily identify flaws. They are critical thinkers and oriented toward problem solving. Sensing focuses on the present. As sensors, ESTJs are "here and now" people. They are factual and process information through the five senses. They see things as they are because they are concrete and literal thinkers. They trust what is certain. ESTJ value realism and common sense. They like ideas with practical applications. As Judging people, ESTJs think sequentially. They value order and organization. Their lives are scheduled and structured. ESTJs seek closure and enjoy completing tasks. They take deadlines seriously. They work then they play. The Judging preference does not mean judgmental. Judging refers to how a day-to-day activities at dealt with. Every person engages the world through four Cognitive Functions. 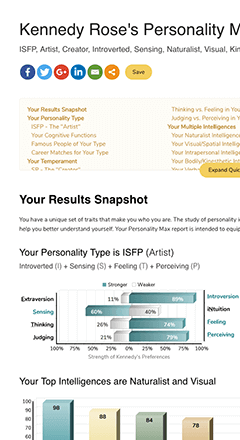 The ESTJ's primary function is Extraverted Thinking and secondary is Introverted Sensing. ESTJs use this function most often. While Thinking (T), ESTJs make decisions based on logic. The Extraverted Thinking function enables them to organize and categorize items such as thoughts and arguments. It is the ability to see the logical consequences of actions. It follows sequence and organization. ESTJs use of this function is somewhat high. Through Sensing (S), ESTJs process data with their five senses. The Introverted Sensing function allows them to remember data in detail and to compare it with current information. It is the ability to link present experiences to past experiences in search for a connection. ESTJs use this function but to a lesser degree. With Intuition (N), ESTJs process new information through impressions, possibilities and meanings. Extraverted Intuition allows them to see different paths or ways. When an ESTJ receives information, they are able to see that there is more than one way to look at things. ESTJs use this function least of the four. When Feeling (F), Overseers make decisions based on feelings, so the Introverted Feeling function allows them to know what they value. It is the ability to see through others and know what they are like as if the ESTJ had internal radar. There is a desire to connect when they identify a person with similar values. Overseers possess a strong work ethic. They are organized and willing to make sacrifices to accomplish a task. They are committed to excellence and have high expectations of others. ESTJs like being appreciated and recognized. As leaders, they provide continuity and direction. They are energized by tangible results. People with the ESTJ personality type may find satisfaction with the following careers which tend to match well with their Overseer personality. Here is a sampling of Famous People and Fictional Characters that may share the ESTJ personality type. ESTJs bring order to chaotic situations. They use common sense and are down-to-earth. They are industrious and service-oriented. ESTJs enjoy people and like staying connected. Their greatest contribution is their ability to preserve traditions and provide security for their family and community.